As much as I would love to wear funny Halloween-themed clothing every day of October, my adulthood responsibilities do not allow for this to be a reality. Sometimes I have to get a little creative and find subtle hints of Halloween cheer to incorporate into my everyday look. One of my favorite accessories to wear for some nerdiness are these tie-front headbands, which are very classy and super comfortable. 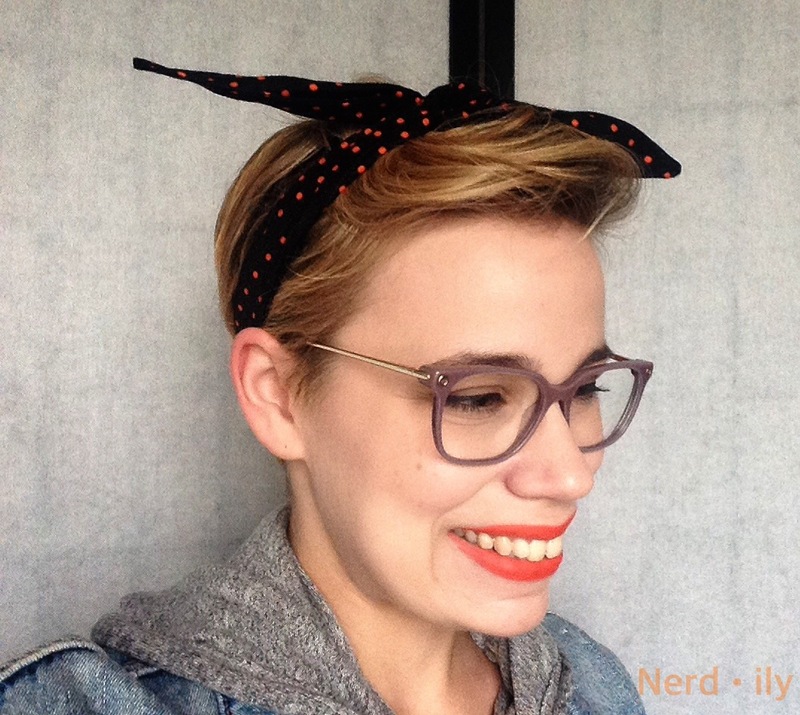 I’ve made myself four headbands with different designs, and I recently made a Halloween-themed one from some cute seasonal fabric I found at Jo-Ann’s. With Halloween coming around the bend, I figured this would be a nice, simple DIY to share. The basis of this tutorial, as well as the template I use here, come from Sew Caroline‘s tutorial, which is available on the Janome website. The tutorial presented here is my own take on the process she outlines, with modifications that I’ve added either for form or function. Today, I’m going to show you my version of how you can make your own to celebrate the season. If you’re a Halloween nerd like I am, then you’re sure to love this quick and easy DIY tutorial! Print off and cut out the template from Sew Caroline. 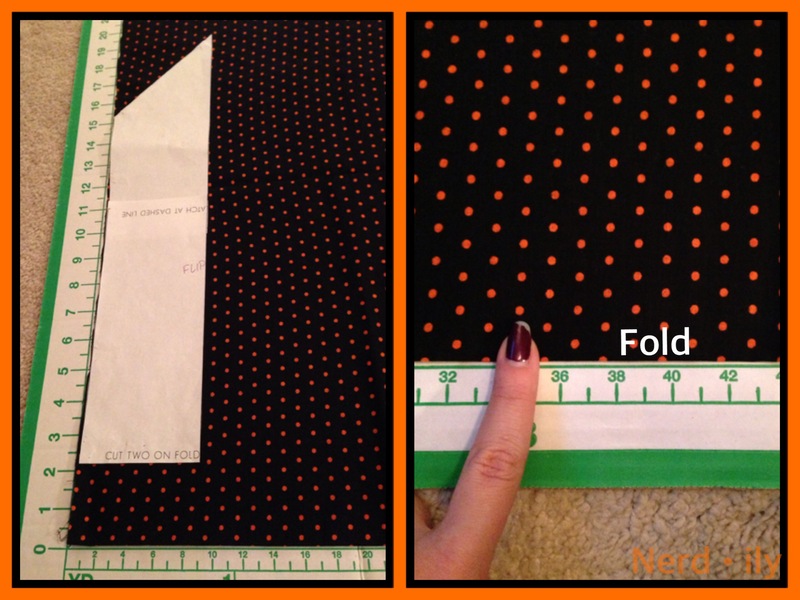 Take your fabric, folded once in half with RIGHT side out, and pin the template to your fabric. 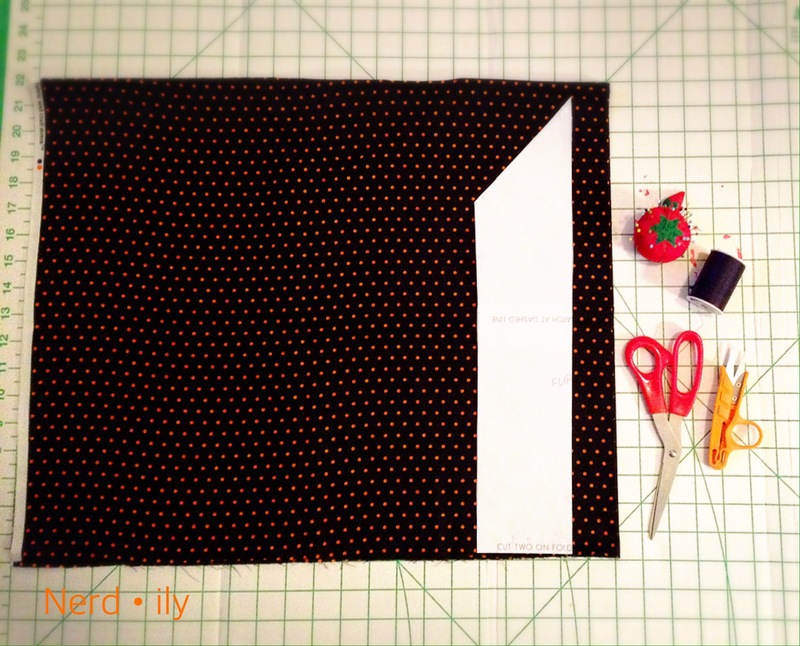 Make sure that the flat, straight end of the template is on the fold of your fabric. NOTE: For my headband, I added 2″ from the bottom to make it longer. I did this because I’m using a cotton broadcloth rather than a stretchy knit fabric, so I added the 2″ to make up for the lack of stretch. Cut out your first fabric piece, place to the side, and flip the template. Cut out your second piece of fabric. You should now have two pieces of fabric which are mirror images of one another. Headbands: now with more cats! 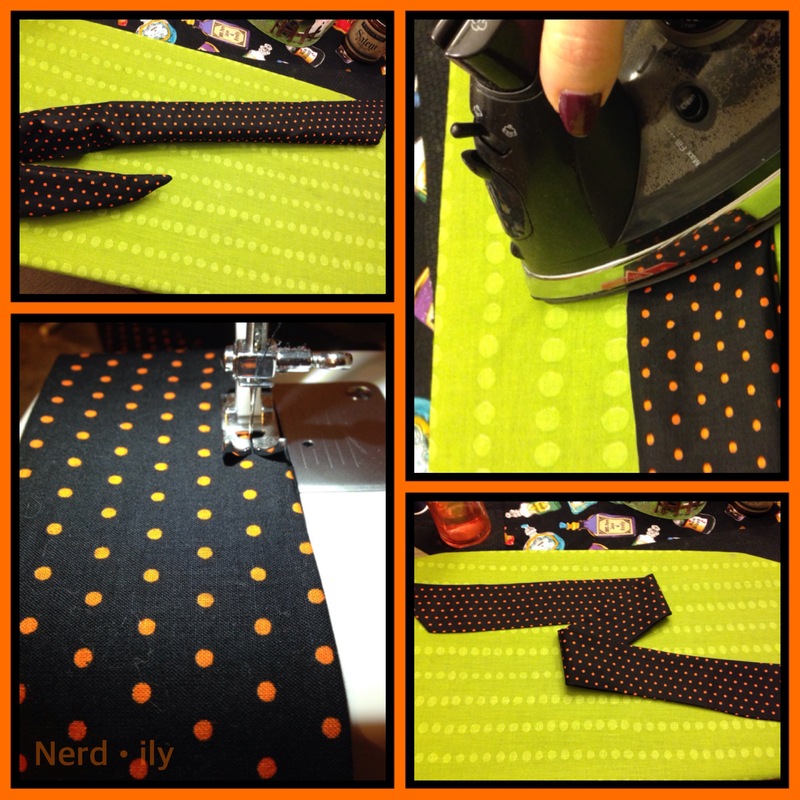 Pin your two pieces RIGHT sides together (WRONG sides out), and take them over to your sewing machine. Straight stitch around the edge with a 3/8″ seam allowance. Leave an opening toward the middle on your edge so you can easily flip the headband inside out.Clip corners after you’ve stitched to avoid excess bulk. PRO TIP: Pin two straight pins about 1 1/2″ apart perpendicularly to mark off the spot where your opening will go. That way you don’t accidentally sew all the way around. Fire up your iron. Flip your headband through the unsewn opening so that the RIGHT sides are out. Taking a chopstick-like item, push the points from the inside. Press your headband. PRO TIP: Keep the unstitched fabric in the opening folded so it stays uniform with the inner seam. Then when you press your headband, this part of the seam will stay put for the next step. 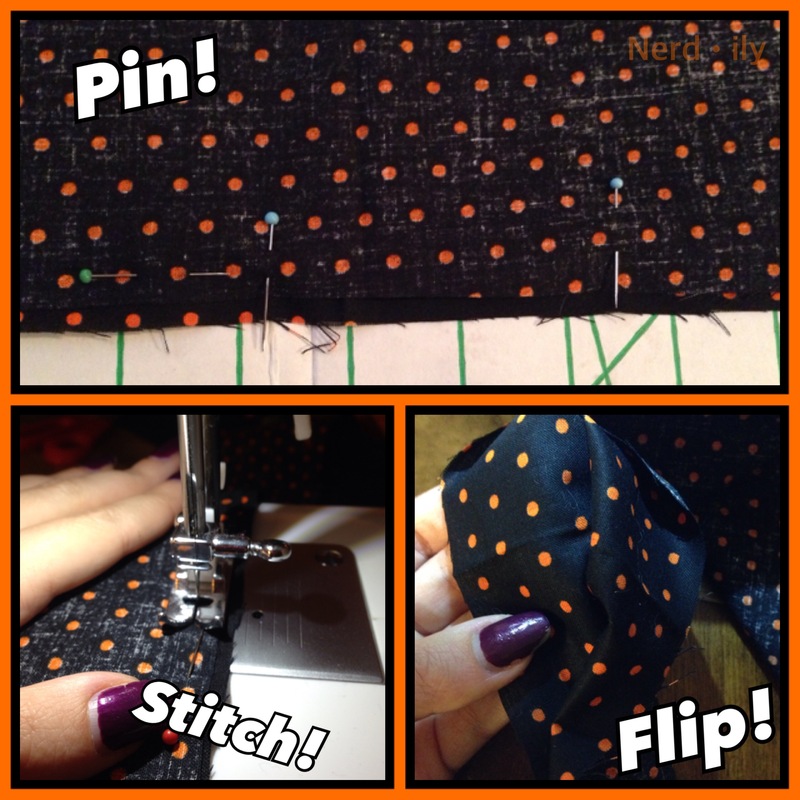 Take your pressed headband back to your sewing machine, and stitch around the outside just like you did in Step 4. Reinforce your stitch. Now wear your new headband! 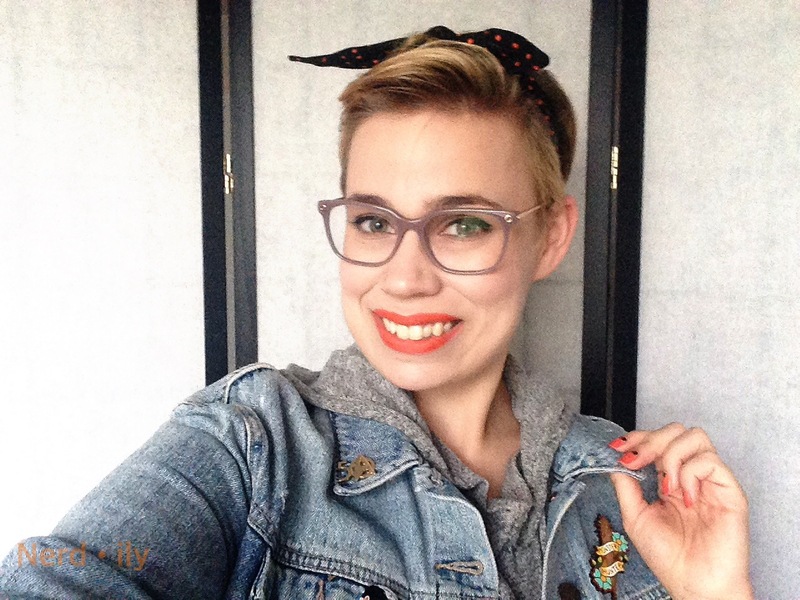 Your spooktacular headband is done! One of the great things about these headbands is their appearance: they are super cute. The look is classic and vintage. If I had longer hair, I’d totally have some victory rolls. The headband is also washable, versatile, and comfortable. 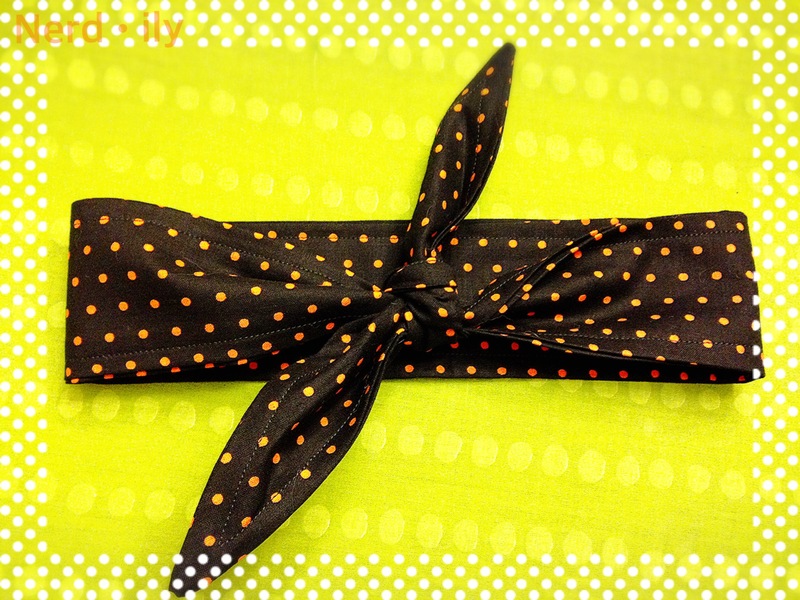 For extra Halloween spirit, combine this headband with any of the 5 Halloween Goodies I shared last week! I know I will. Don’t forget to share your casual Halloween looks with me on Twitter, Facebook, or Instagram by using #nerdiween! Let’s nerd out about Halloween together! Also share your sewing creations with me if you go with this tutorial. That’s awesome! I’m not really a head band kind of girl, but that’s really cute. Eeee this is so cute! I love headbands like this as well; such a great retro vibe. It looks so great on you!